For the 2014 model year, two major luxury sedans have been completely redesigned to look better than ever before along with a nicely upgraded interior and engine lineup – we’re talking about the 2014 Cadillac CTS and the 2014 Mercedes-Benz E Class. The 2014 Cadillac CTS has received a completely new look with a more aggressive interior while the class Mercedes-Benz E Class received some sporty design touches including new headlights and taillights. It’s been a while since the CTS was able to pinpoint a direct competitor. Previously the Cadillac CTS was lost in between competing with the likes of the BMW 3 Series/Mercedes C-Class or a BMW 5 Series/Mercedes-Benz E-Class. GM has now added the Cadillac ATS to its lineup, which is a direct competitor to the 3 Series/C-Class – in turn giving the CTS the chance to grow in size and luxury. In our eyes – the Mercedes-Benz E Class is definitely considered the world’s best and we are here to show you how Cadillac’s new CTS stacks up to the industry legend from Stuttgart. E350: 3.5 liter V6 – 302-hp. E550: 4.6 liter twin-turbo V8 – 402-hp. Transmission: 7-speed automatic for both models. Top Speed: 155 mph for both models. 2.0: 2.0 liter 4-cylinder turbo – 272-hp. 3.6 Twin Turbo: 17/25 mpg. All in all, on paper at least, the Cadillac CTS has definitely grown as a model. The model seems to be better positioned to compete with its German competitors. 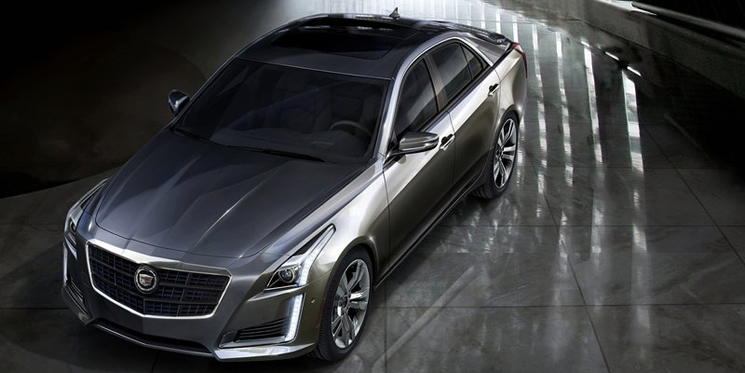 However, we’ll have to wait and see what the pricing for the CTS comes out to be and if it’s worth giving it a chance over the E-Class – the leading industry legend. « Does every Audi really look the same? Do you want to see something different?